Josh and I are hanging out in the cafe next to the Prada outlet outside of Florence. He’s got the new improved Denver Nuggets on his PSP and I’ve got my blackberry and typepad mobile. Life is good. And its the perfect time to talk about Stadium Arcadium. Josh’s favorite record of the year by his favorite band of the moment, The Red Hot Chili Peppers. Stadium Arcadium would be number one for sure had it been twelve or fourteen songs. I listened to the entire two disc set about three times. Then I made an iTunes playlist of the top tracks and played that the rest of the year. 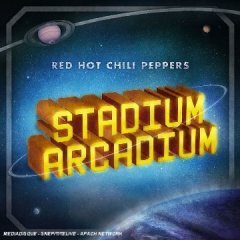 Stadium Arcadium has some amazing songs on it; 21st Century, Dani California (killed by radio overplay), Charlie, Snow/Hey Oh, Tell Me Baby, Hump De Bump, Torture Me, Strip My Mind and a bunch more. I am doing this from memory and don’t have my iPod. But the hands down best song on the record and the song that should have ended the record is Turn It Again. That solo by John Frusciante is the best guitar solo on a studio record I’ve heard in a long long time. They should have ended the record with the heat from that solo still smoking in your ears. I can’t help think woulda/coulda/shoulda with Stadium Arcadium and that’s why its number two, not number one.